Saving Grace in Uganda began in 2007, when Alon and Val Bransdorfer were ministering in displaced people camps in Northern Uganda. These camps were formed as a result of the civil war led by Joseph Kony and his rebel army. While serving in the town of Lira, Alon and Val encountered many children between the ages of three and fifteen who had no adult to feed, clothe or provide medical care to them. Immediately following the murder of one of the children by a bread vendor, Alon and Val, with the help of the Kuhn family, opened up the home they were renting to 26 children. Alon and Val recruited a Ugandan man named Fred, a former street child himself, who had already been ministering alongside them, to take care of these rescued orphans. Shortly after that, the Bransdorfers returned to the states to raise funds and that tiny home became Uncle Fred's House, a safe place for many street children. As years passed, Uncle Fred's House became no longer big enough to sustain all the children being taken in, so Saving Grace in Uganda purchased 15 acres of land. Due to the generosity of many supporters, Saving Grace Children's Village has grown to four children's homes which house a total of 50 former street children, and Saving Grace Primary School which enrolls over 500 students each year. The ministry is overseen by a group of dedicated volunteers who serve with their talents, resources and time, making it possible to have no paid staff in the United States. Board members fund all administrative costs. 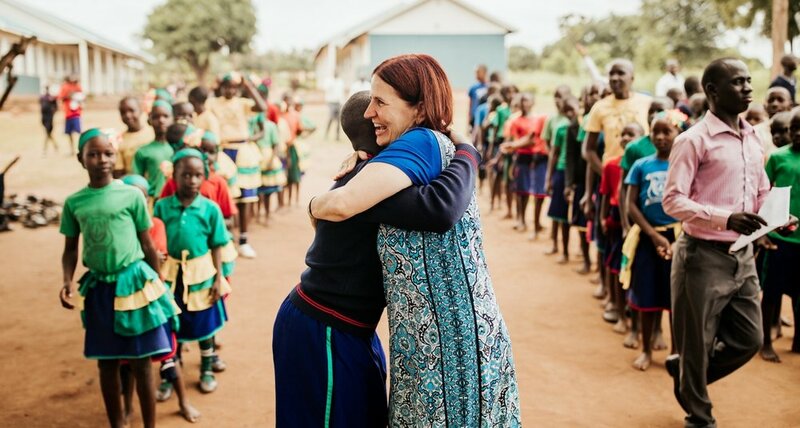 Valerie began ministering to street children in Lira, Uganda in 2006. She and her husband Alon established Uncle Fred's House when they returned in 2007. She has a heart to see street children and their communities transformed through God's ultimate gift of salvation. Alon serves as president of the SGU board and as a mentor to Uncle Fred. He has a B.A. in Psychology from Montclair State University and is married to Valerie. They have six children. While in Uganda in 2007, Alon fell in love with the people there and he desires to see children and their families reunited and restored. Suzanne has worked with Saving Grace in Uganda since its beginning in 2007 and has overseen much of its operation since then. She desires to know God’s heart for the fatherless and seeks to join Him in what He is doing to care for them. She believes she was created to share the truth of God's saving grace with the next generation. Suzanne is married to Larry who is one of SGU's biggest supporters. They have four grown children who are married as well as two grandchildren. They attend Action Church in Winter Springs, Fl. Joel oversees the creative and technological aspects of Saving Grace in Uganda as well as operations systems in the U.S. and Uganda. He believes that the end of street life is an attainable goal. He recognizes that God has a great love for orphans and wants to educate and engage others to intercede on their behalf. Joel has been serving SGU since he was 15 years old. He runs a wedding photography business with his wife Sammy and they attend Action Church in Winter Springs, FL. Sammy is a jack of all trades at SGU, helping the administrators with logistics, managing child-sponsor relations and fundraising projects, and running our social media accounts. If something needs to be done, she is often the person who does it. Her love for the the children in Uganda motivates her to make a difference in their lives and help take more of them off the streets. She dreams to help raise up children who will one day end street life in Uganda. Sammy graduated with a degree in Family Youth and Community Sciences from the University of Florida. Emily Ray handles the legal and accounting logistics of Saving Grace in Uganda. She recognizes children as the next generation of believers who will continue to spread the gospel to a lost and dying world. She believes it is critical to empower them to become contributing members of their communities and to teach them how influence others to freedom in Christ. Emily is a CPA who has been working in public accounting since her graduation from the University of Central Florida in 2007. She, her husband, and their young daughter live in Oviedo, Florida and attend Grace Church. John first became connected with Saving Grace when he visited while on a mission trip with his church. He returned the next year for an extended 12-week stay at Uncle Fred's House, where his heart for these children and this ministry really took root. John has been a board member with SGU since 2010. John manages the Learning Services department at the Cerner Corporation in Augusta, Georgia. John is married to Sarah and together they have two boys. They are members of First Presbyterian Church Augusta where John serves as a deacon. Fred Ojok became a father to 23 street boys when SGU was founded in 2007. At the time he was only 22 years old. A former street child himself, Fred can relate to the children SGU serves in a way that few can. He oversees all of the workings of the ministry and has the final say in every decision that is made from Uganda. Much of the ministry’s success can be credited to his fearless leadership. Fred has a diploma in Gender and Social Development and also serves as an honorary youth pastor at the church most SGU staff attend, Truth Fountain. Kosta fills many roles in the ministry in Lira, Uganda. She is a prayer warrior, Bible teacher, and encourager as well as friend and mother-figure to the children who live at Uncle Fred's House and those still living on the streets. She is married to Uncle Fred and together they have three precious daughters named Valerie, Suzanne, and Maya and one son named Josiah. Kosta has a certificate in social work and is fluent in five languages. She is an incredible gift to Saving Grace in Uganda. Quinto Opio joined the staff of Saving Grace in Uganda within of a year of its founding. Quinto oversees the children's village and helps with the daily challenges of running a street children's program. He also provides medical care to the children and helps handle several logistical projects including the street children feedings on Saturdays. He is married to Florence who works in the accounting department at Saving Grace Primary School. Together they have one son. Leonard oversees the legal acquisition process and retention of all of our children. He helps to identify children living on the streets who are in the greatest need by learning their stories and works alongside the American staff to maintain the relationship between each child and their sponsor. He is an advocate for children through tough family situations and a parent to those who have none. Leonard’s persistence, organizational skills and heart for children make him incredibly valuable to Saving Grace. Leonard was the first member of his entire family to become educated at any level, graduating with a bachelor’s degree in social sciences. He is married and has one child with his beautiful wife. Christopher is responsible for discipling our children and seeing that they continue to develop spiritually and grow in their knowledge of the Lord. He inspires, instills and motivates our children into spiritual boldness and maturity. On a daily basis he leads devotions, prayer programs and worship times at the village. His heart is fully devoted to God and to children. Christopher is fluent in 3 languages and has a bachelor’s degree in Physics and Mathematics from Makerere University, the most prestigious school in all of Uganda. In his free time he loves to play soccer and listen to Nigerian gospel music. Francis serves as a liaison between current street children and Saving Grace in Uganda. He works to build relationships with them and meet their need physical and emotional needs whenever possible. This is an important role because Francis helps these children to see that even though they are still living on the streets, they are not forgotten and are still valued and loved. Francis’ cheerful and outgoing personality makes him a perfect fit for this role. He has a bachelor’s degree in accounting. He is one of the best players on the Saving Grace staff soccer team and also enjoys American worship music. Joy is one of Saving Grace in Uganda’s longest serving employees and has overseen all of the finances for the Ugandan side Saving Grace since near it’s beginning. She is honest, reliable and organized, skills that are essential for developing budgets, spending money wisely and keeping record of all expenditures. Joy has a bachelor’s degree in accounting. She is married to Uncle Fred’s brother, Christopher, and has four children, all of whom attend Saving Grace Primary School. Sarah’s caring demeanor is essential in making sure the staff is informed, encouraged and empowered to complete the tasks at hand. She guides the administrative tasks of the organization, managing the 50+ Ugandan staff members. She is highly respected around Lira and is often requested to speak at community events. Sarah is a kindhearted wife and mother to three children. She has a bachelor’s degree in social work and social administration. Peter is the headmaster of Saving Grace Primary School, ranked the best school in Lira and one of the best schools in all of Northern Uganda. He oversees the 30+ teachers at the school and honorably represents the school in the community of Lira, Uganda. Peter has an undeniable and unmatched love for children, desiring to see them learn, excel and achieve their life goals. His heart is not just for children but also for their families. He spends much of his spare time investing in the lives of the families of children at Saving Grace Primary School. Peter has a bachelor’s degree in public administration. He is happily married and has two children. We’re Blessed to Have Over 50 Ugandan Staff! drivers, guards, and financial officers; several of whom are former street children.